Audio4fun recommends that users only download AV Voice Changer Software Diamond from its official website and verified partners to ensure the best cyber security. AV Voice Changer Software Diamond is the all-in-one voice mastering tool developed and distributed by Audio4fun. The software can help users to change their voice in real time to the opposite gender or virtually any voice at all, to process pre-recorded audio files in batches, as well as many other audio tasks. Creating and refining real-time voice changing algorithm from Audio4fun for over twenty years in the audio technology field, the software has the ability to take up on any audio activity that users need. “When downloading AV Voice Changer Software Diamond, only our official website and our verified partners are able to protect users by offering the most reliable authenticity and integrity; for it is only from those sites that users can find the code signing certificate from DigiCert. In fact, if you pay attention to the Properties of the official install file, you will see the Digital Signature, which confirms that it is really from the publisher, Audio4fun, and that means it is not altered by any third party,” said Chris R.F., Head of Quality Administration. - Do not just click that big Download button right away, it is recommended to scroll down a bit to see if there is anything strange. - Hover the mouse at the Download button, but do not click right away. Users can look at the bottom of their browser to see the download link (usually an https: //www dot something dot com). Focus on the file name and link domain to see if the information is trustful and transparent. Make sure it includes a file name extension (like .EXE, .RAR, etc.) and is in the same domain as the current page. - Last but not least, stick with the reputable sites when downloading .EXE files, because executable files are much more likely to have serious security problems when downloaded from spamming sites. All in all, the simplest and also safest way to get AV Voice Changer Software Diamond is to download the install file from the main website for Audio4fun. 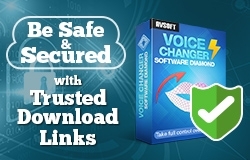 All readers can visit https://www.audio4fun.com/voice-changer.htm to freely download the software with trusted cyber security and transparent information.